My first encounter with DARKEST ERA was at 2009's edition of Up The Hammers Festival in Athens, Greece. Then they were promoting their first EP The Journey Through Damnation. I really liked their show at the Festival so of course I invested in the EP and was equally impressed by that one. 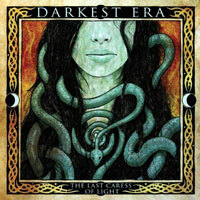 Now, two years and one more EP (The Oaks Session) later DARKEST ERA has evolved into one really tight and heavy entity. The Last Caress Of Light is a trip through the Northern Ireland wilderness. I wouldn't say that DARKES ERA is an extremely folksy sounding band, I would rather say profane, pagan influenced heavy Metal. PRIMORDIAL absolutely comes to mind when listening to DARKEST ERA but also BATHORY, after the Hammerheart album. So, this band is absolutely more commercial than the two mentioned. The feeling in the music is perhaps the same but Dwayne Krum Maguire has a far more melodic voice. Album opener The Morrigan is a very catchy song and the acoustic grinding guitars really sets the dark and gloomy mood instantly. Heathen Burial is a little more brutal is a little rawer track and the melancholy and anxiety in the melodies is really phenomenal. The closer and the title track (slightly enhanced title though, Last Caress Of Light Before The Dark) is a really epic piece that clocks in on 11 minutes. I think this track is the one that really shows how much talent this band has. For both good and bad DARKEST ERA isn't very extreme in their style. The base is pretty much ordinary Heavy Metal which can make them disappear in the huge mass of upcoming bands today. On the other hand, the type of melodies their songs are based on still are quite unique. And it's good to see that a band that isn't especially trendy (you know, emo, screamo and so on) is pushed by a major label as Metal Blade. The only thing that comes to mind to nag a little about is perhaps the lack of variety in Dwayne's melodies. Even if all the songs are really good I think it could have been even stronger with a little more variation in the vocal expression and melodies. A petty thing to point out really because The Last Caress Of Light is an amazing album, absolutely worth checking out for all Metal heads.